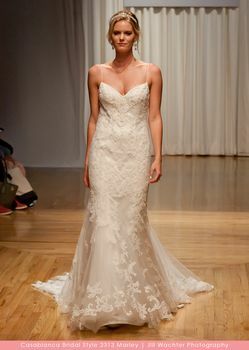 When it comes to Marley, this lace fit and flare gown is elevated by a touch of drama that extends through the cathedral length train. Delicate Chantilly lace peeks out from below a layer of larger lace appliques, for beautiful texture and contrast. The drama of the train is further enhanced by the low scoop illusion back.